How much commission is each sales territory generating and how much are we paying out in rep splits? http://www.dynamacs.com/wp-content/uploads/EmpoweringdynaMACS_Logo-Vertical.png 0 0 dynaMACS Software http://www.dynamacs.com/wp-content/uploads/EmpoweringdynaMACS_Logo-Vertical.png dynaMACS Software2016-07-25 13:43:032016-07-25 13:43:03How much commission is each sales territory generating and how much are we paying out in rep splits? Tip #1604 – Did you Know that the Customer State and City can be Printed on Your Sales IQ Reports? When selecting the Print button from the Sales IQ Customer screen, the report does not display the customer’s state and city as you can see in the example below. 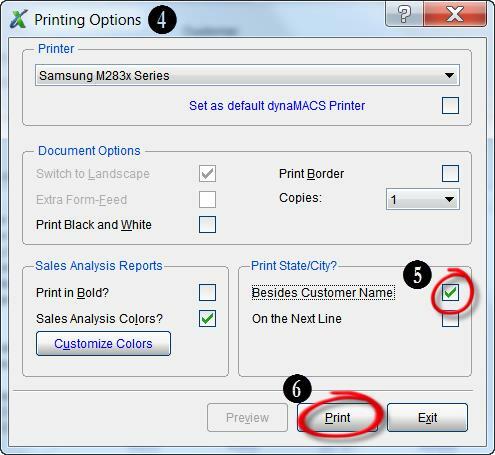 This tip will give you instructions to change your printing options enabling you to print that information on the Sales IQ Customer report. After making selections defining your Sales IQ customer query, click on the Down Arrow button to the right of the Print button. Choose Select from the drop down box. You will see that the Print button has now changed to a Select button. Choose the Select button. A Printing Options box will open. From here you to change your default printer and edit other printing options. http://www.dynamacs.com/wp-content/uploads/EmpoweringdynaMACS_Logo-Vertical.png 0 0 dynaMACS Software http://www.dynamacs.com/wp-content/uploads/EmpoweringdynaMACS_Logo-Vertical.png dynaMACS Software2016-04-30 11:37:592017-07-20 10:01:59Tip #1604 - Did you Know that the Customer State and City can be Printed on Your Sales IQ Reports? You must first delete the mobile user from the dynaMACS Mobile Configuration screen and then delete it from the User Class Maintenance screen. Below are the steps required to delete a dynaMACS Mobile user. 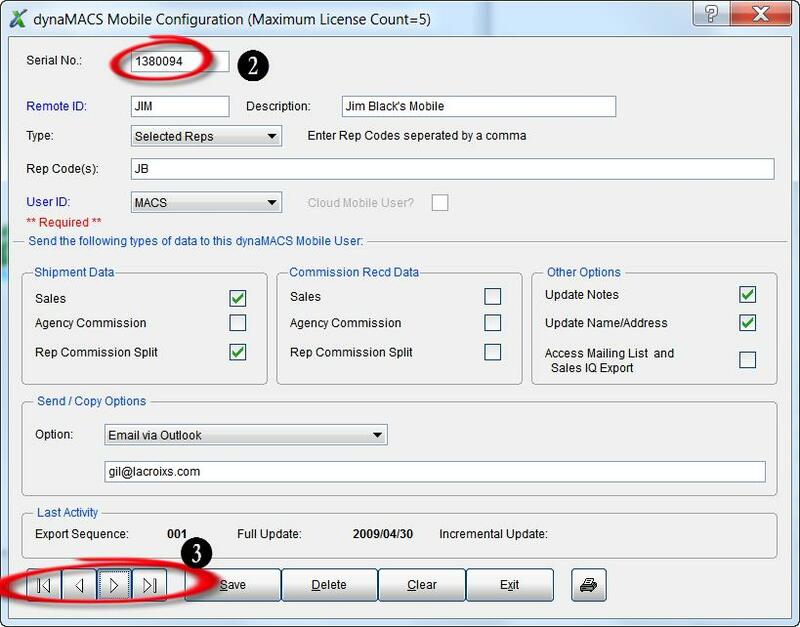 The first step is to delete the mobile user from the dynaMACS Mobile Configuration screen. From the main dynaMACS screen select Other Functions>Administration>dynaMACS Mobile Configuration. 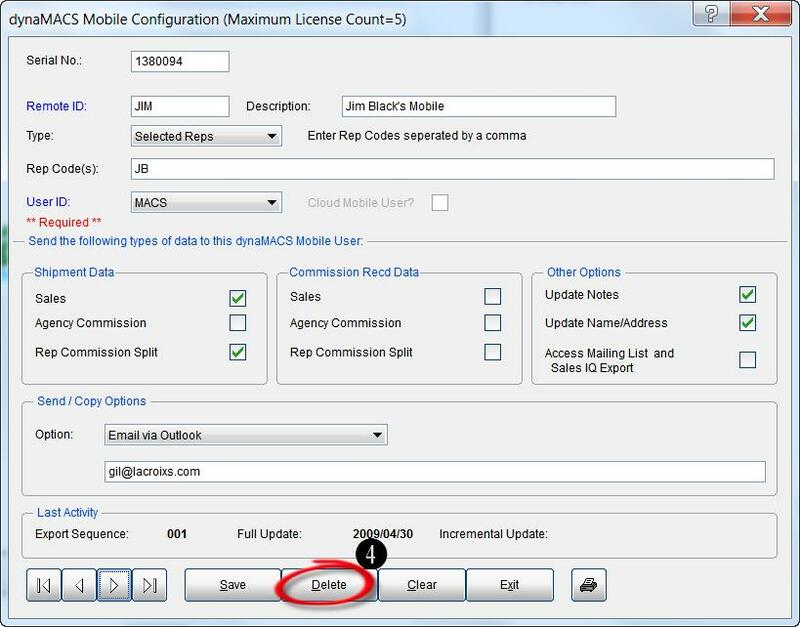 From the dynaMACS Mobile Configuration screen, enter the serial # of the user that you wish to delete. If you don’t know the serial number, you can use the Arrow buttons at the bottom left of the screen to look through all of your mobile users until you find the correct one. With the mobile user displayed in the dynaMACS Mobile Configuration screen, select the Delete button at the bottom of the screen. Confirm that you wish to delete this user by selecting the Yes button in the confirmation dialog box. The mobile user has now been deleted from the dynaMACS Mobile Configuration screen. The last step is to delete the mobile user from the dynaMACS User Class Maintenance screen. From the main dynaMACS screen select Other Functions>Security>User/Class Maintenance. 2. Enter the Mobile User ID or select it from the drop down list in the User-ID field. 3. With the correct Mobile User ID selected, click the Delete button. 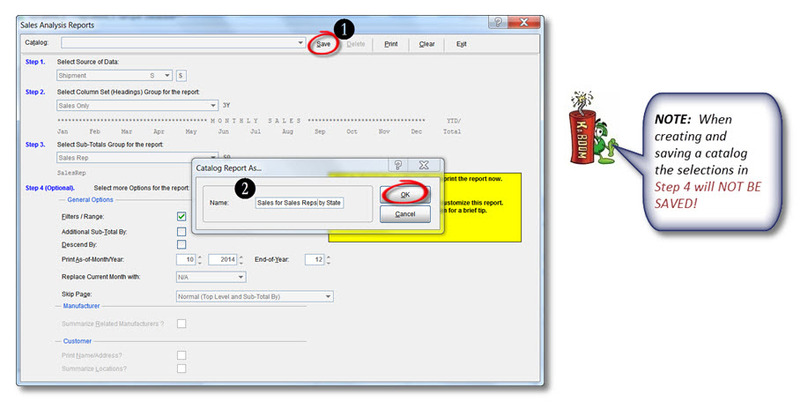 The Sales Analysis report feature in dynaMACS provides the ability to save a sales analysis report by “cataloging” it. This eliminates the need to re-enter the report criteria each time you need to run the report by selecting it from the Catalog drop down menu in the Sales Analysis Reports screen. 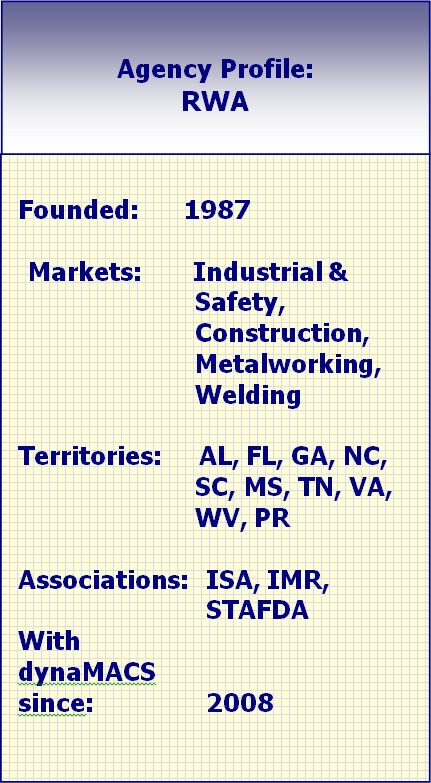 The following are examples of creating, retrieving and deleting catalogs. After selecting your report criteria in the Sales Analysis Reports screen, select the Save button at the top of the screen. In the Catalog Report As box, enter a name for your report in the Name field and select the OK button. To access your saved catalogs from the Sales Analysis Reports screen, select the Down Arrow next to the Catalog field and then select the catalog for the report you want to print. From the Sales Analysis Reports screen, select the Down Arrow next to the Catalog field and then select the catalog that you wish to delete. 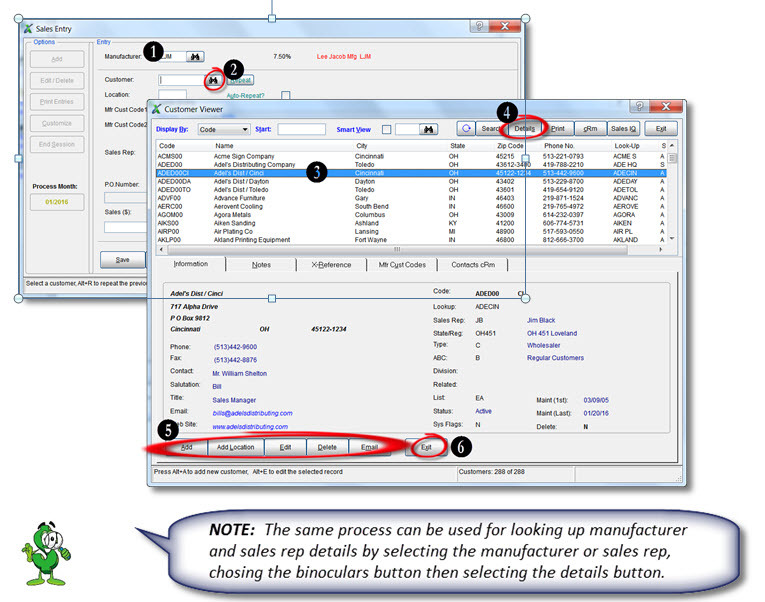 Once the catalog is displayed; select the Delete button at the top of the Sales Analysis Reports screen to delete the catalog. dynaMACS provides the ability to look up detailed information, make changes or add a location “on-the-fly” during sales entry. In the following example we will look up the details of the Customer Adel’s Dist/Cinci while in the Sales Entry screen. From the Sales Entry screen enter the Manufacturer code. For this example we will use LJM. Select the look up button next to the Customer field which will open the Customer Viewer screen with all customers for the selected manufacturer displayed. Highlight the customer. For this example we will select Adel’s Dist/Cinci. Select the Details button. This screen will display all of this customer’s details. You may make additions or modifications. To return to the Sales Entry screen, select the Exit button at the bottom of the screen.